A further 23 people were pulled alive this morning from the ruins of the eight-storey factory which caved in on Wednesday. A female survivor, seen at bottom right, is evacuated from the garment factory building that collapsed. TWO FACTORY OWNERS along with two engineers have been arrested in Bangladesh following the collapse of a factory that killed at least 341 people. Bazlus Samad, the chairman of New Wave Buttons and New Wave Style factories, and Mahmudur Rahaman Tapash, a managing director, were detained shortly after midnight, after Prime Minister Sheikh Hasina vowed those responsible for the country’s deadliest industrial disaster would be hunted down. The senior investigating officer Kaiser Matubbor said that two municipal engineers who had given the building the all-clear after an inspection on Tuesday night had also been arrested and would face similar charges. A further 23 people were pulled alive this morning from the ruins of the eight-storey Rana Plaza compound which caved in on Wednesday while thousands of garment workers were stitching clothes for Western brands. But emergency workers warned their task was getting steadily harder as survivors were losing their strength to call for help. Survivors have said the building developed visible cracks on Tuesday, but bosses ordered staff to return to the production lines. Hundreds of relatives of missing workers have massed at the site to witness the search for their loved ones. Akram Hossain, a deputy director of the fire service, said there were still some survivors trapped in pockets of the wreckage but warned their chances were “diminishing by the minute”. “The stench of dead bodies is so strong that we have to work with one hand and air freshener in the other,” Al Amin, a volunteer said. Mahbubur Rahman, the fire service’s director of operations, said rescuers were carving tunnels through the wreckage and bodies could be seen everywhere. Merina Begum, among those rescued earlier today, said she and seven fellow workers trapped in the same area had been without food or water since Thursday. “This morning when the rescue workers brought juice, ice cream and cold water, it was tastiest food I’ve ever had,” she said. Bangladesh is the world’s number two garment manufacturer and the industry is the mainstay of the economy. But it has a shocking safety record, with a factory fire killing 111 people in November. Britain’s Primark and Spain’s Mango have acknowledged having their products made in the block, while other brands including Walmart are investigating. The accident has prompted new accusations from activists that Western firms place profit before safety by sourcing their products from a country where textile workers often earn less than $40 a month. Email “'Stench of dead bodies is so strong' says Bangladesh building rescuers”. 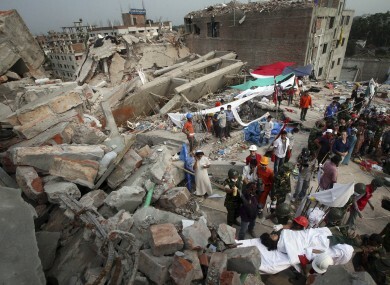 Feedback on “'Stench of dead bodies is so strong' says Bangladesh building rescuers”.